By now, small-business marketing is feeling a bit old hat. You’ve done a lot of what you’ve been told to do. You’ve seen moderate success. But, you’ve worn out a lot of the Big Marketing Ideas touted on every blog and in every book. You’ve probably tried some of the lesser known ideas, too. And you’re very, very tired of running across marketing ideas targeted at medium and large businesses; they’re expensive, they’re boring, and they don’t work for your business. Update your marketing plan. One of the best things you can do, before you get to the other 49 items on this list, is to revisit your current marketing strategy. Do you still have the same goals and objectives, plans and methods? Do you need to add or subtract anything? Are you working toward achieving your goals – and are your current efforts working? Etcetera, etcetera. Make more money by increasing your prices. And now, the second most-important tactic to boosting your bottom line: the dreaded price increase. It may be a scary prospect – how can you raise prices without losing clients and/or customers? – but as the world become more expensive (or you increase in expertise), you’ll need to find a way to sell a price increase to your clients. Pump it up with a press release. Think the press release has gone the way of the dinosaurs? Luckily for small businesses, it hasn’t. The key to writing a brand-building press release is in the hook – what new happening, current event, or other aspect of your business can you make interesting? – and in its distribution which, depending on your budget (zero or just string? ), can be as simple as soliciting your local newspaper. Embrace the power of joint collaboration. Oh, the power of the joint business venture! Whether you’re joining forces with your next-door neighbor or collaborating with an industry partner across the globe, consider joining together to create creative collateral (a webinar, for example), a great package deal, or joint event, or another deliverable. Ask for endorsements. Yes, seriously. I know a lot of our readers are introverts. Asking for praise may be the last thing you want to do but, luckily, the internet is here for you. Whether you’re a freelancer asking for endorsements via LinkedIn or enabling reviews on your Facebook Page, customer-sourced testimonials are a totally free way to prove your value. Give your product or service away. Wait, that doesn’t sound free now, does it? And, okay, if you sell $10K home generators, this may not work for you. But, for most professionals, it’s possible to give away a product, or a product sample, or a highly targeted, value-rich free consultation about your product or service. If it provides true value (and not just faux promotion), then your potential customers will want it. Offer incentives to current subscribers. Email list incentives are not restricted to discounts alone; there are many irresistible offers you can offer your subscribers, not only to keep them coming back but also to create and air of exclusivity. Even better, many of today’s most popular incentives are digital collateral, so they incur no additional cost beyond the time you take to create them. Build a new package for your products or services. You’re familiar with product bundles – buy this whole package, get an $X discount! – so why not try it with your product or service? For products, this can be as easy as bundling similar goods; for services, it can be a bit trickier, but think outside the box. Social media managers, for example, can create economical monthly packages that incorporate common deliverables. Leverage existing relationships to grow your audience. 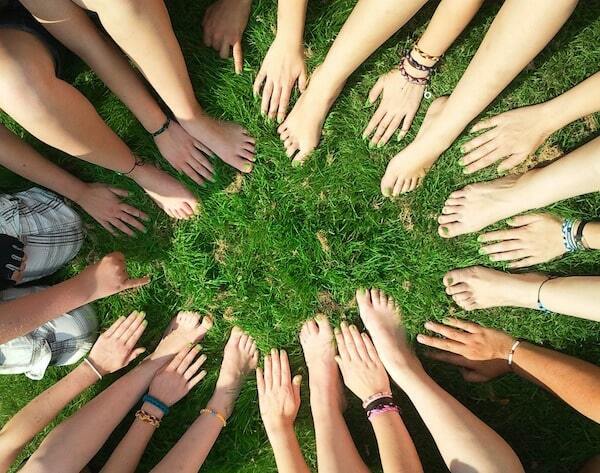 Word-of-mouth is still very alive and well, which means so is relationship marketing. Spend some time away from the office building relationship with past clients, colleagues, local business owners, friends, and even family – anyone who could benefit from what you do. But, tread carefully: Only share your goods with people who could truly benefit, or you’ll come off sounding disingenuous and overly self-promotional. Reward the most loyal of your customers. Okay, so by now we’ve covered the basics of offering exclusive deals to subscribers and offering discounts to your email list. But, consider stepping it up a big notch and offering ultra-exclusive – think really, truly exclusive for only the smallest upper percentile of your customers – discounts to loyal customers who have been with you for years, or purchased a certain amount of product, or achieved any other profit-producing milestone. Wiggle your way into a radio guest spot. People still love listening to the radio and, with the advent of internet-based niche radio, there’s a place for almost everyone. So, start digging around to find your place– a radio spot (or podcast) where you can spread your expertise, help people, and snag some free promotion. Comment, comment, and comment some more. If you’re looking for an easy, free, and low-stress way to start networking within your industry, then start commenting on industry blogs. Do not promote yourself; just comment, add some valuable insight, or otherwise contribute to the conversation. Do this over weeks and months, and people will learn who you are. Some will navigate to your site. And a few will likely become customers. Hop aboard the trend bandwagon. We know – this one feels pretty disingenuous, doesn’t it? But in reality, embracing trends – whether they be Twitter hashtags or Google trending keywords – is a good way to keep on top of what the market’s talking about, what your customers want, and what aspects of your product or service are most in demand. Embrace the hashtags. While we’re on the topic of trending hashtags, we’re going to go all in. ALL. IN. 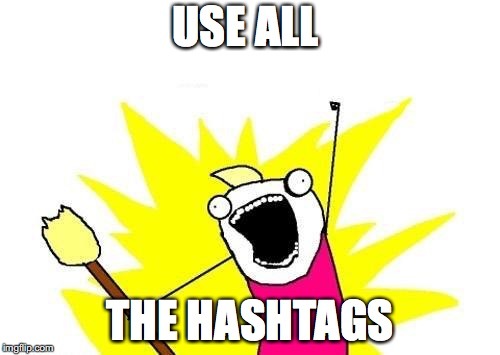 Because hashtags are now a key component of any social media marketing strategy and, best of all, they’re free. Use hashtags wisely to get the word out, leverage current memes, cultivate content, and otherwise draw and retain interest in your brand. Share engaging content. But not your own. Well, of course you should share your own but that’s an obvious choice and not one for this list. What we’re talking about here is sharing attention-grabbing content from other sources. We love this for two main reasons: 1) It’s free, even in time (you don’t write it, just link it); and 2) It’s a great way to network, be a part of your industry, and spread a bit of praise to experts with whom you’d like to build relationships. Improve the images you use. Whether we’re talking about blog imagery, brochure photos, infographics, or your all-important social media posts, you can pull off great bang-for-your-buck with a few high-quality professional photos (check out stock photo sites or even freebies like Pixabay) paired with slick graphics, courtesy of Canva, Piktochart, or similar drag-and-drop image designers. An extra 15 minutes can make a big difference in the impact of your images. Snag immediate interest with your first live stream. Facebook or YouTube or anywhere in between, livestreaming is hot. It’s a great way to capture attention in today’s distracted world, as you grab people right now, when they’re online and seeking either distraction or knowledge. What’s more, your livestream notifications are much more likely to show up in your followers’ news feeds/notifications, which is a huge benefit in today’s hard-to-get-eyes marketing world. Re-share user-generated content. Whether you’re sourcing content your ferreted out or re-sharing content your followers have shared via your branded hashtag, posting your fans’ content can create a strong sense of community and inclusivity. What’s more, you make your followers feel accepted and part of your in-crowd, thus boosting brand loyalty in the process. Recycle, reuse, repurpose! It’s not just for plastic: You can recycle, reuse, and repurpose your existing content, which saves you the time and cost of creating new collateral. For example, if you’ve created a series of niche blog posts, consider updating their info and then turning them into a really powerful digital download, either in exchange for email addresses or as a paid eBook. Embrace the Rafflecopter and run an online contest. Everyone loves a good contest and nowhere more than on social media. If you’re looking to grow your social following quickly, running a social media contest will do more than boost your followers, but can also send plenty of new traffic to your website (and, hopefully, your email list). Create brand recognition (and genuine value) via your newsletter. Too many small businesses consider email newsletters as the odd promotional medium when, in reality, your email newsletter builds brand awareness, keeps you present in your customers’ minds, and delivers time-sensitive discounts, deals, and other can’t-say-not offers. Don’t just blog. Guest blog. Maintaining your own brand blog is a great thing – and one you probably already do. That’s why it’s not on this list of things you haven’t thought of. What you may not already do, though, is guest blog; that is, blog on other sites within your industry, to connect with influencers, grow your email list, and otherwise grow your business. Need blog ideas? Check out these valuable tips for generating blog post ideas that work. Learn, practice, and the write a killer sales letters. There is still power in the sales letter – or, at the very least, in the principles behind the sales letter. So, do your business and yourself a huge favor, and learn how to write a foolproof sales letter. Whether you use it or not (and yes, you can use it both in print or via email, landing page, or other digital delivery), understanding the psychology of sales and how it relates to your product/service, will go a long way toward organizing your thoughts and offerings into a coherent offer. Host a webinar, virtual meeting, or seminar. Whether you know it or not, you have valuable knowledge in something your customers want to know. (It could be as simple as how your product works and how that will solve their problems.) And whether you know it or not, a webinar or online event can be a great place to share that knowledge – and build your email list and customer base. Revamp your logo and/or tagline. Your logo and brand tagline say a lot about your business: Not only do they sum up what they do, but they give visual and voice clues as to your brand personality. If you created your own logo via a free service, or if you’re just not totally satisfied with how it looks, consider getting it professionally redesigned. There are plenty of logo design services out there, including Fiverr (be sure to read reviews and vet your freelancer! ), that can help you create a logo that really shows off who you are. 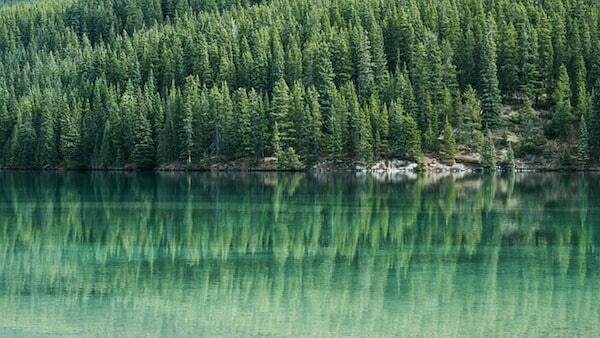 Leverage evergreen content for leads and sales. Evergreen content is content that will stay fresh and/or relevant for days, weeks, months and even years to come. It’s also content that is hyper-relevant to your industry and will pull organic search results, social media clicks, and other traffic to your site, where you can then hook leads into your sales funnel. Don’t just create; share videos! Video is king and that’s not going to change any time soon, but that doesn’t mean you have to invest $thousands into your video marketing. You can start small by sharing (and learning from) others’ videos and when you’re ready, you can move on to creating mid-quality videos on a decent phone. 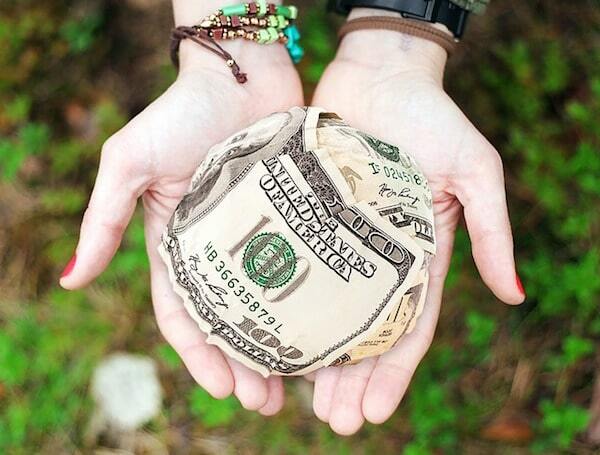 Bottom line: You don’t need the big bucks to create branded video. Capture shares, visibility, and new followers with a giveaway or contest. The beauty of a running a giveaway or contest is that it’s easy and, depending on what you offer, can be very inexpensive. Obviously, you can give away your own product or service but, if that doesn’t lend itself to the model, you can give away related collateral. For example, if you’re a social media manager, consider running a giveaway for a camera or phone (with a great camera) that your clients could use to generate their own images. Looking for some inspiration? Check out these amazing Instagram giveaways. Dip your toes into video with instructional content. Video can be an intimidating medium to dive into, which is why we love the humble but oh-so-useful instructional video. Not only is it cheap – hi, smartphone camera! – but most consumers don’t have high expectations for instructional videos; the main requirement is that they be clear and, therefore, helpful. So go ahead – instruct your industry in something you know well and, while you’re in the process, make sure your expertise and personality shine. Dive deep into the world of Reddit. Chances are, your social strategy doesn’t include Reddit but we’re here to tell you, this can be grassroots marketing gold. The self-titled “front page of the internet,” Reddit can be great for hyper-niche, high-quality content, particularly that directed at a tech-savvy (or self-professed geeky) audience. Tread very, very carefully here, though, because one false step and you could become a Reddit joke. Start churning out articles. Or, at least, article ideas. The barrier to entry is sometimes enough to stop you in your tracks but, let’s be blunt – branded content doesn’t have to be scary. To get started with content marketing, you’ll need to start working on ideas. Lots and lots of ideas. Then, start writing. No, seriously. Just. Start. Writing. The sooner you start, the sooner you’ll have your first draft. And second draft. And then, your first published piece of content marketing. Go super niche. Have you ever considered creating a super-niche website or sub-brand? The beauty in reaching out to a hyper-niche audience is that you feel like an answer to all their problems. After all, it’s one thing to market your natural skincare products but it’s another to offer natural, handmade skincare products for people who are allergic to coconut oil. Because, even you already offer those products, they’re buried deep on your site. But, if you build a website for your coconut oil-free, handmade and natural skincare products, you’re going to rank well in search engines andfeel like a perfect match for people who need these products. Lure new customers into trying out your discounts. Depending on what kind of good or service you offer, free coupons and/or discounts can be just the ticket to tempting new customers to give you a try. Don’t be afraid to double-up on your low-cost marketing here, either: If you already print business cards, flyers, door hangers, etc. – any type of print media that you hand to customers – print the backside with your coupon. Network like it’s your job. There’s this tendency today to do everything online, even if you’re a local brick-and-mortar. (And especially if you’re not.) But, face-to-face networking still has great value, within both your community and your industry. Think there are no opportunities out there? Check networking sites like Meetup.com and you may find just the right opportunity. Speak your knowledge far and wide. While you may not think of yourself as a public speaker, most entrepreneurs and business owners have valuable knowledge to share. So, whether you’re looking to make some extra bank via pro speaking engagements or are looking to leverage knowledge for potential leads, know that you can uncover lucrative speaking opportunities in almost any industry. Actively participate in community events. If your business is even a bit local (or if you’re just an active part of your community), this is a good time to get involved. Get out there. Donate your time, your resources, or your services. Volunteer something for a silent auction or local charity. Connect to your community and you’ll find it earns dividends over the next months, years and decades. Rub elbows with local media. If you’ve done anything of note lately – won an award, remodeled your space, contributed to the community, or done anything else newsworthy or unique – then there’s a chance that local medial will be interested. Give it a go; the worst they can say is no. Canvass the neighborhood for new customers. If it still works for politicians and lawn services, then why not for you? Indeed, while canvassing the neighborhood definitely falls into the “old-school” category, we also happily label it an oldie-but-goody. Because it works! Give it a try with inexpensive flyers or brochures, and start handing them out a local businesses, stores, parks, or other public places where your customers frequent. Hang your offer on all the doors. If you think canvassing stops at flyers, think again! Door hangers are not only very effective – since they’re likely the only thing hung on the door, they’re very noticeable, but they can also be very creative. Bring your brand into 2019 with an on-brand, possibly humorous, and very eye-catching door hanger. Promote yourself with business cards. Oh hey there, old friend! If you think the business card was dead, here’s another reality check: Not only are business cards alive and well, but they’re still a very viable marketing tactic. Indeed, your business card should accompany every handshake and every new business connection, and thanks to the incredibly creative business cards you can now design, your card can help your brand really stand out from the crowd. Handwrite your thank-you’s. If it sounds like the post-holiday, post-birthday homework your mom used to give you in the 70s and 80s, then it’s time to embrace the lessons of your childhood. Indeed, in the digital age it’s the handwritten notes that allow you to stand out – especially if you mail your handwritten goodies, accompanied by coupons, freebies, or other inclusions. Embrace the beauty of the brochure. Brochures don’t work for every business but for the ones that they do – boy, do they! And, considering that brochures are increasingly less common, producing and handing out an on-trend brochure grabs attention, spreads knowledge, and demonstrates your ability to think outside the digital box. Slap on those car magnets. Nope, not kidding. You don’t see car magnets very often anymore – and that’s why they can be so effective. (Especially when paired with great imagery.) It’ll depend on your industry but say, if you own a hotel or vacation rental in a nearby drive-to destination, advertising that hotel or vacation rental on your car, in the drive-from destination, can be just the suggestion would-be vacationers need. Bottom line: Car signs can be very effective. Network and grow your following via a local business card drawing. If you have a physical storefront, chances are you also have feet in the door. And that means that you’re in prime position to host a business card drawing – think: of the fishbowl variety with a local gift certificate as prize – that’ll encourage more people into your shop and into your business sphere. What’s more, you’ll be able to inform the participants via email that they did/didn’t win, while inviting them to join your email list for notifications of future drawings (among other info). 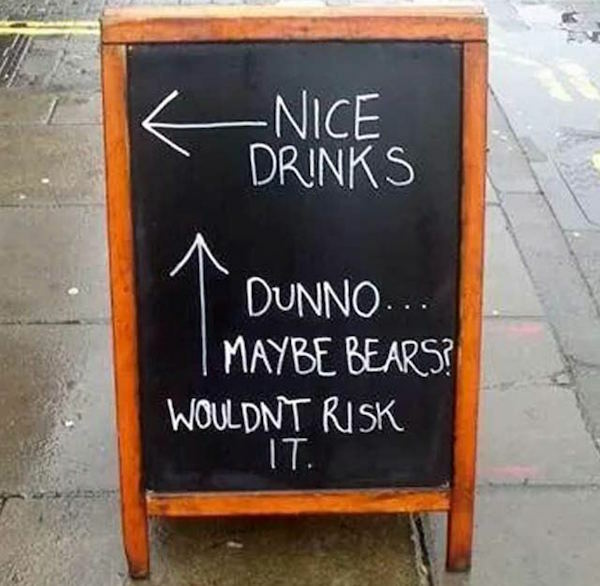 Set out a sidewalk sign (and maybe be funny about it). If you get pedestrian traffic into your local store, then a sidewalk sign can act as a most perfect welcome. Huge bonus points if you can find a way to make it funny. Trust us – people will want to come in and find more of the funny. Now, you tell us – what are you favorite ideas on our list? What do you think you’ll tackle first? And, what guerrilla marketing ideas did we miss? Please share!